Jonathan D. Feit « James McElroy & Diehl, P.A. Jonathan Feit received his Bachelor of Arts from Auburn University and his Juris Doctor from the University of Tennessee College of Law. After several years working for a large law firm in the Mid-west, he clerked for the Mecklenburg County, North Carolina District & Superior Court Judges in 1999 and joined James, McElroy & Diehl in 2001. Jonathan is a family law lawyer and his primary practice areas involve child custody, child support, spousal support, domestic violence and equitable distribution. Jonathan is a frequent speaker at continuing legal education seminars throughout the State for family law lawyers; volunteers for a number of non-profit organizations in the area; serves on the Board of Trustees and the Development Committee for the Blumenthal Performing Arts; and is a regular presenter for the Charlotte Mecklenburg Schools Academic Internship Program. Jonathan is an avid college football fan and enjoys spending time with his family, traveling and playing golf. 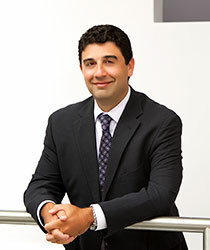 Jonathan Feit elected to Family Law Section Council of the N.C.B.A.